Lowen is the 4★ Staff user Wind desperately needed, and is excellent even by non-elemental standards. With Bog cleanse, Skill Prep and a Recovery Potency passive, he's focused entirely on healing and support. Although he lacks the instant regen or shield Skills of other healers, defense buffs work perfectly with other Wind Adventurers such as Aeleen and Louise. In addition to being the highest-rarity option for a Wind team, Lowen has strong passives that amp up his healing even further. Winds, Protect Us becomes Regen once maxed out, making him ideal for surviving long, grueling challenges with multiple spawns. A boy who came to the castle with his sister Louise. Sheltered and protected his whole life, he desires to mature into an adult capable of protecting his beloved sibling. His cute and honest demeanor earns the affection of all. 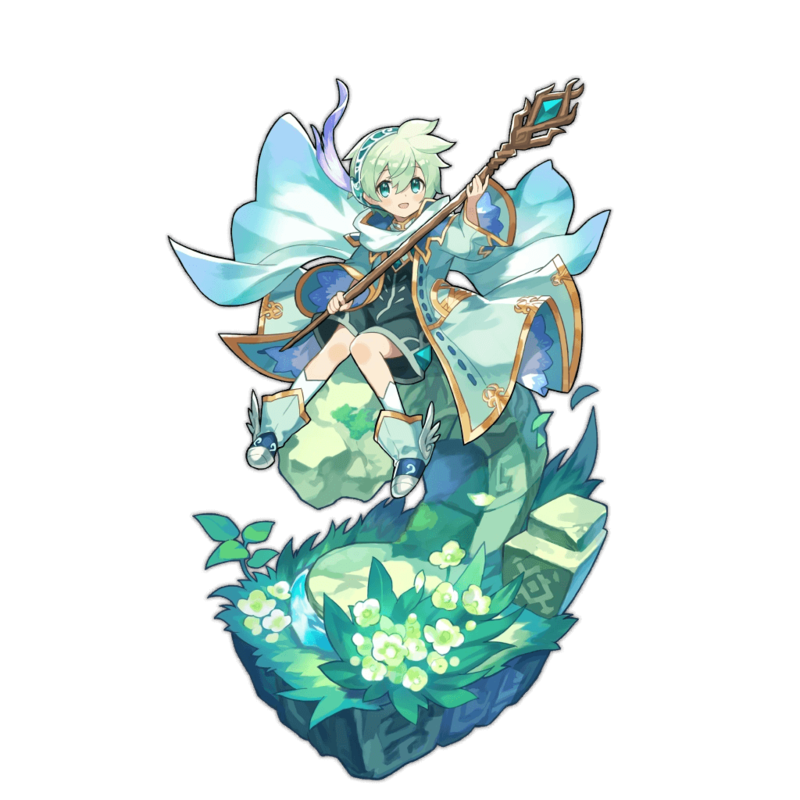 Lowen is a fun-sized 4★ Staff user and premier Wind healer equipped with several tools for success. Maxing out at 22% unconditional Recovery Potency, the Dependable Brother earns his title with burst heals and an anti-Bog kit almost tailored for Mercury. 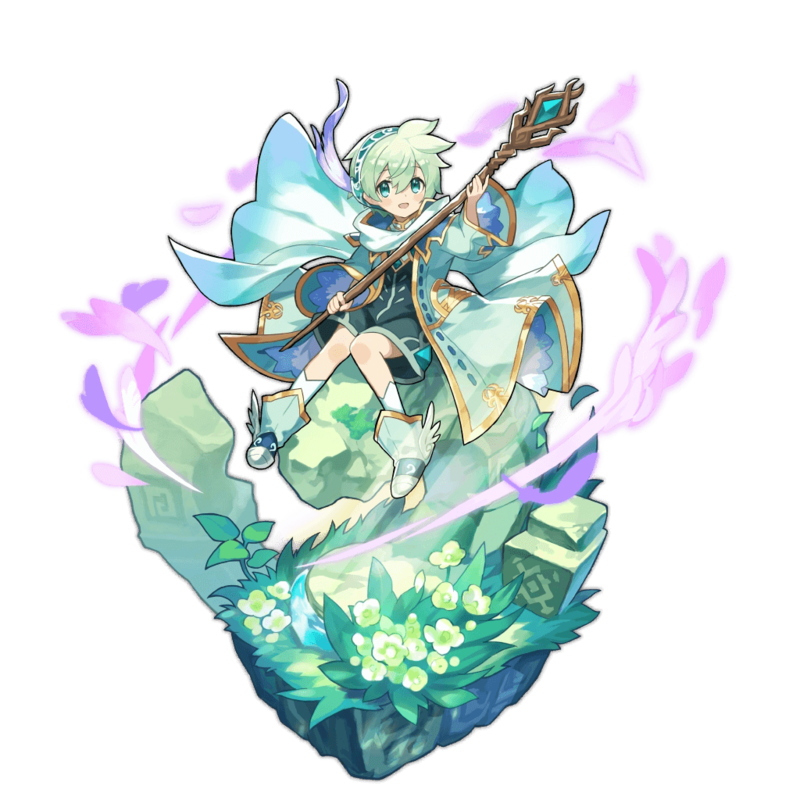 Though he lacks more coveted support skills such as continuous healing or shields, Lowen provides Defense buffs that mesh well with other Wind adventurers like Aeleen or fellow newcomer Louise. High SP costs are counterbalanced by having first casts ready almost immediately. Lowen boasts both Bog immunity and the ability to purge Bog from teammates, making him an asset in any current and future Mercury-related content. Burst healing does not account for chip damage from multiple enemies and isn’t ideal for supporting allies who need full HP to shine. Additionally, if only one teammate is heavily damaged, Lowen’s primary heal must be “wasted” on healthy allies. A Staff and a lack of offensive skills means Lowen will be pushed around by even the lowest IO ads. Garuda - Healing efficiency scales when an adventurer’s HP, thus a 40-60% HP buff is optimal. A self-heal adds icing on the cake. Stribog - 30-45% HP is still substantial and more easily attainable as a 4* pull. High MGS - Gives Lowen some teeth in the event his teammates are doing well enough on their own. Phoenix - Burst and continuous healing make her every healer’s go-to, regardless of mismatching elements. Midgardsormr or Sylvia - Affordable options that are easily MUB. Budget options: Beauty's Balm for an extra heal. Recovery Potency: Give Me Your Wounded, Louise’s Hobbies, Destiny’s Hand, Cleo’s Ruse, What a Handful! Restores HP to all allies and removes bog. Increases the entire team's defense by 15% for 15 seconds, and increases each adventurer's max HP by 5% for the remainder of the quest. Once HP buffs reach the limit, an HP recovery effect is granted instead. Increases the entire team's defense by 20% for 15 seconds, and increases each adventurer's max HP by 10% for the remainder of the quest. Once HP buffs reach the limit, an HP recovery effect is granted instead.